I might be developing an avocado obsession. There's nothing wrong with that, right? In searching the fridge for something for dinner, cheese stood out. I'm not sure why, but a grilled cheese sandwich just sounded so good. I still have some avocados left so I was trying to come up with a way to combine that with a grilled cheese sandwich. The classic with american cheese wouldn't do so I jazzed it up a bit with some mozzarella. It was still missing something though. It needed a little color so I thought tomatoes would be the perfect addition. And why not add some bacon? The salty, crunchiness would be a nice compliment to the smooth avocado. I threw it all on some multi-grain bread and grilled it up. End result = yum. 1. Cook bacon and set aside to drain. 3. 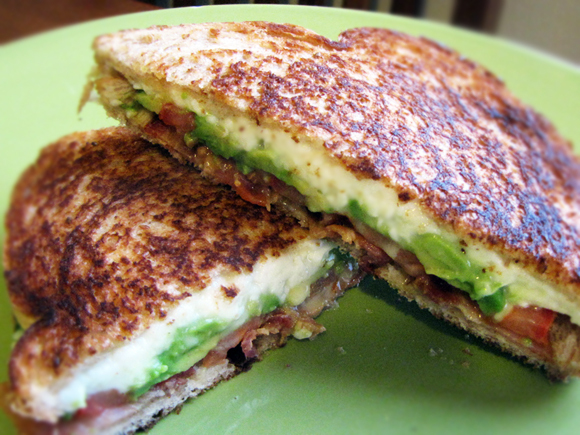 Layer the cheese, avocado, tomato, and bacon onto one slice of bread and top with the other piece of bread. 4. Put about 1/4 TB butter in a small pan and melt. 5. Toast each side for about 2-3 minutes or until cheese is melted and the bread is a nice golden brown color. The next time I make this (yes, there will be a next time) I might add a little chipotle mayo to one of the slices of bread. It was a really good sandwich, but I wouldn't mind a little kick to it.